Danny Tudhope grew up in Irvine, Ayrshire in Scotland. His family has no connections with racing and he had not considered a career as a jockey until it was suggested to him by a careers advisor. 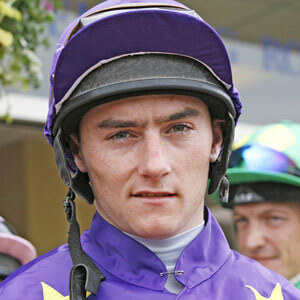 He is a graduate of the Northern Racing College and started out as an apprentice jockey with Declan Carroll in Yorkshire. Every year, some of the most promising apprentices get to ride against similarly promising young riders from the main racing countries in Europe. This initiative provided Daniel with his first winner. It came at San Rossore, Pisa, Italy in October 2003 in the Premio European Association of Racing Schools. He now mainly rides for trainers David O’Meara and Jim Goldie and it was for the former that he rode the 25-1 outsider, Blue Bajan, into second place in the 2011 Emirates Airline Yorkshire Cup, the first race in the Long Distance category of the QIPCO British Champions Series, and he followed that with third place on the same horse in the third Long Distance race, the Artemis Goodwood Cup. In 2012 his star ride was Penitent, who following wins in Listed company at Doncaster and Group 2 company at Sandown Park, gave him a first QIPCO British Champions Series success in the Nayef Joel Stakes at Newmarket on September 28. He built on that in 2014, riding G Force to victory in the Betfred Sprint Cup at Haydock Park, his first Group 1 victory and then he rode Custom Cut to victory in the Shadwell Joel Stakes. In 2018, he enjoyed for Series glory aboard Laurens in the Kingdom of Bahrain Sun Chariot Stakes. It was the 32-year-old’s 944th career success in Britain.